What is my Username and Password (I forgot)? Within your hosting account, there are various tools that you can use to manage your hosting account and build a website. Not all of these tools are tied together, and in this article, we hope to clear up any confusion on logins between the multiple systems. When you log into AMP, you actually login using your email address as a username. If you have forgotten your password, please use the I don't know my password link on the AMP log in page. Please note, when using the Forgot Password feature for AMP, enter just your domain name (do not include http:// or www). Email passwords can be reset in cPanel and from the webmail interface. However, you would need to know the cPanel password in order to gain access to the interface that can change the email password. The webmail interface requires that you know the existing email password, so this option may not the best if you've lost your email account password. To see the steps necessary to reset your password using either of these methods, please read changing your email password. FTP stands for file transfer protocol, and is used for uploading and download files from your hosting account. Your cPanel username and password is actually an ftp account as well, so you can use your cPanel username and password to login to your account via ftp. You also have the option to create ftp accounts for other users. For more help with this, please see How to create additional ftp accounts. If you do not know your username, you can always go into the database to locate it as it is stored there. The following steps will walk you through doing so. First, log into cPanel and select the PHPMyAdmin option. Once in PHPMyAdmin, select the database that you have Wordpress installed on. The table that your Wordpress users are stored in the the users table. Of course, the name of this table will be prefaced with whatever prefix that you defined when you installed Wordpress. Click on that table on the left side of the screen to open it up. Once the table is open, you should see a few different columns there. Your Wordpress user is defined in the user_login column. I've totally blanked on the admin password for a Joomla site I created a few years back. I've tried resetting this from the Cpanel installation panel for Joomla, but it doesn't seem to stick. Any tricks to know about? We have a great article on <a href="http://www.inmotionhosting.com/support/website/joomla/reset-joomla-password">how to reset your Joomla password</a>. I'd would start with trying the techniques listed in that article. How do I find - NOT change - my email password? There is no place for you to view your email password. All you can do is reset it via the cPanel. If you can't remember your email password, you can reset your email account password using cPanel. If you can't remember your cPanel password, you can reset your cPanel password in your Account Management Panel (AMP). If you can't remember your AMP password, you can reset it using the AMP reset password link, which will require you to access your email address associated with your AMP account. If that email address is the email address that you are trying to reset the password for, then you should contact Live Technical Support to further assist you. Thanks! It might be nice to add a note to the "welcome email" that you are dealing with three separate passwords. My former hosts had different logins for billing, cPanel & tickets but not for support per se. Do you need a separate login/password for Support? So far I have different ones for AMP & cPanel, but I often have problems posting comments/questions (hope this one takes) ... I enter the comment, but when after doing the captcha and then clicking SUBMIT COMMENT, the screen redisplays and my comment is not there. Do they not show up right away? Are they held for approval or something? I am not sure what is happening. I was able to post one comment at the bottom of a help page a day or so ago, but nothing today (I fully expect this one to disappear, too). Any ideas at what is going wrong? Yes, comments on articles are not displayed until they have been approved. This is to help avoid the many spam posts we receive. The Support Center is our public forum and does not require login to comment on articles or ask questions. In order to comment on a "question" you would have to be logged in. AMP deals mostly with your billing information/dates, and also has access to your cPanel (or you can reset your cPanel password). While, cPanel is where your website files/database/emails are located. InMotion's login and password systems would put CIA encryption to shame. razorboy, we're glad you approve! I CAN'T ACCESS MY ACCOUNT, EVEN THOUGH YOU SENT ME PASSWORD, IT STILL SAY THAT IT WRONG INFO. HOW CAN I ACCESS MY ACCOUNT ONLINE? ACHIEVECARD INFO. KEEP POPING UP. Thank you for contacting us. If your problems persist, I recommend contacting Live Support, so they can test your password and provide account specific assistance. Rachel, you can find your information in AMP. 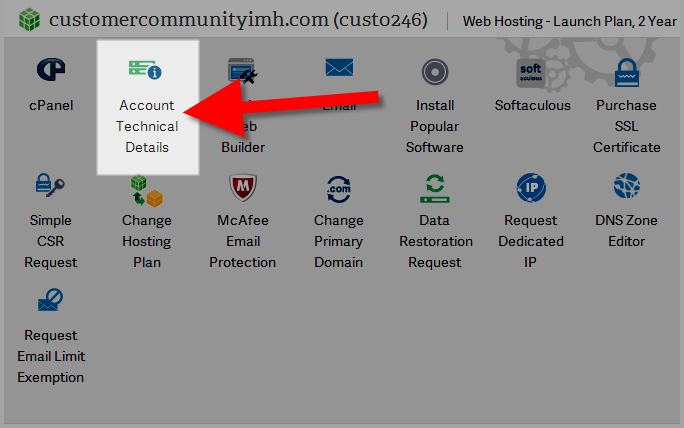 Here's an article on <a href="http://www.inmotionhosting.com/support/edu/cpanel/getting-started-cpanel/how-to-log-into-cpanel#access-via-amp">accessing cPanel via AMP</a>. I hope this helps! I do not have my password and username for my cPanel. How do I obtain? As I stuck and unable to edit the details on the website. As a new customer I did receive the welcome email but still it is not clear to me how to report failures to the technical support. I have tried logging in into the support site but my user name or email are not recognised. Do I need a seperate username for that? Is there a live chat somewhere for support? Sorry for the problem with logging in. You should be logging into the Account Management Panel (AMP) using your email address and password that you set. There is also a forgot password option on the screen. If you continue to have problems, contact our our live technical support team. Click on the link for information on how to reach them via email/phone/chat. You can also go to the bottom of the support center to see the information contact support team - including a link for chat support. This article is great and very informative i really like this post. Thanks ..
How long should it take to get intro email with login info? You should be contacted around 30 minutes after you sign up by our confirmations team. Once they complete your confirmation, you should receive an email within 15-20 minutes with instructions on how to get started. Thank you for your question about your cPanel password. We do not know your password, but you can reset your cPanel password in AMP. You do not need to know the original password to create a new one in AMP. Any usernames would already be created for you. could you clarify what specific username you are looking for? Nearly all usernames are able to be located from within the instructions in this article. How long should it take to get my intro email with login info? Over an hour? Looking at your account notes, it appears your welcome email was sent out about 2 hours ago. Please be sure to double-check any spam or junk folders to make sure it didn't end up there. It should have come from support@inmotionhosting.com with the subject Welcome to InMotion Hosting!. If you still are not seeing it, please use the Support Chat link from the top-right of our website to ensure that we have the correct email address on file for you and that there are not issues delivering email to you there. In cPanel click "Email Accounts" in the "Email" section to view your existing email accounts. Your private information is not something that we are able to provide via this public forum. You may, however, use the instructions in this article to obtain any information that you may need. All basic settings needed for the account has gone down the drain. Will you please resend?